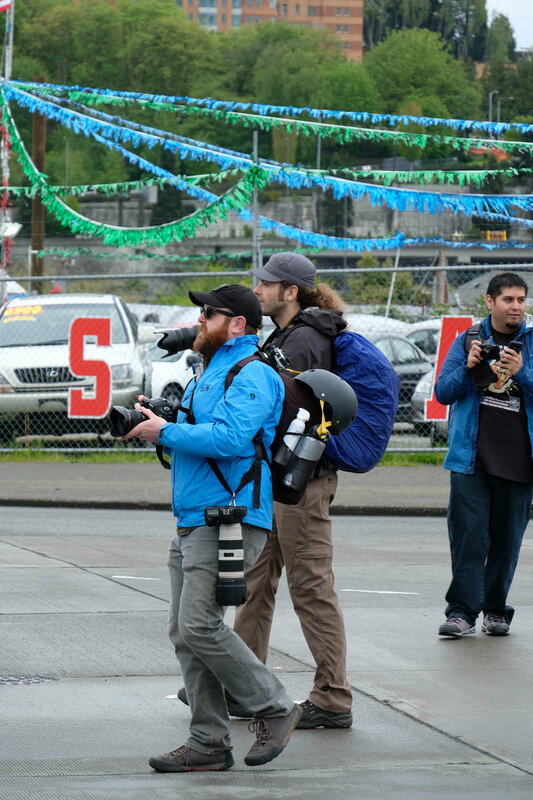 On 1 May 2017 I headed out with my cameras to cover Seattle's May Day protests. I caught parts of three protests: the Rally and March for Workers and Immigrant Rights (not sure on the official plural vs. possessive ruling there), a march on Amazon, and a pro-/anti-Trump protest at Westlake Park. It was my first May Day protest. I've read about them, and I’ve seen the photos of confrontations between protestors and police, tear gas and smoke blowing through the streets, and broken windows. On Monday, the protests were peaceful. I've read that five people were arrested. But the protests also seemed disjointed, a discordant mix of angst, anger, calls to action, solidarity, and unease. That’s probably consistent with previous May Day protests. I mention it for two reasons. First, from a photojournalism perspective, I found it challenging to focus on unifying themes. I haven’t looked through the images that Seattle’s veteran photojournalists got, but some of the stories I’ve read seem to reflect the sometimes confusing diversity of the marchers and signs. I tried to focus, with limited success, on smaller stories and groups. Second, after the protests, there was some talk of protest fatigue (Joel Connelly, SeattlePI). I wondered about that as I was walking around. I did think that there seemed to be less energy than in recent protests, but that is impossible to quantify and may have reflected my attitude about covering my fifth or sixth protest this year. Regardless, I’m wary of grand conclusions. There may be some protest fatigue, but it was also a work day, the weather wasn’t great, and people likely anticipated the possibility of confrontations between protestors and police. 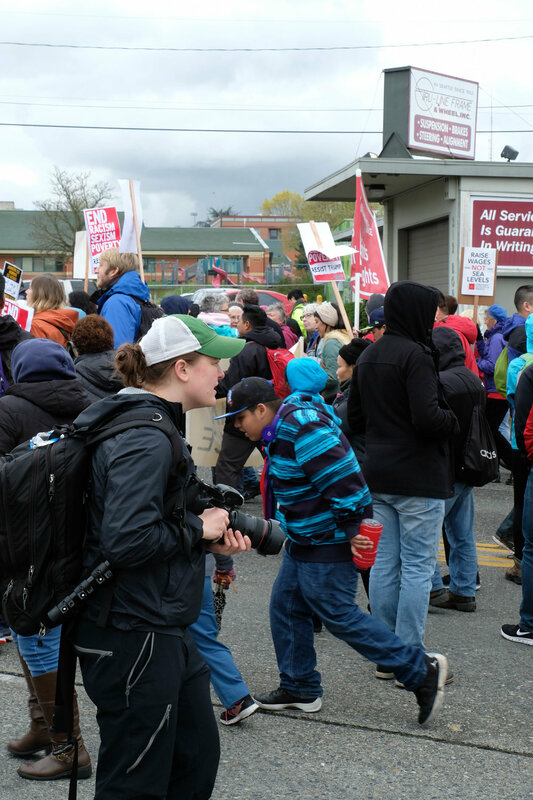 Fatigue didn't appear to be an issue at the Judkins Park rally for Workers and Immigrant Rights. Speakers stressed that immigrants and workers play an important role in America, one they should be proud of, and reminded them about their rights when speaking to law enforcement officials. When the march began, the broad umbrella of groups, messages, and causes unfolded. I'm not suggesting disorganization, but instead a myriad of signs and banners. * I hesitated to add this because I briefly switched to black and white JPGs. I prefer black and white, but because it is the only black and white image in this set, it could appear that I am adding a layer of subtle commentary. I'm not. I shot about 20 black and white images. In hindsight, I wish I'd shot this in color. I will look into whether it is possible to switch the image's embedded Fujifilm film simulation to color. The protests were interesting, but I found myself paying almost as much attention to the coverage of the protests. I am starting to recognize other photojournalists, and it's impressive (and daunting) to watch the effort they put into capturing images, interviews, and video and immediately disseminating that information. Reporters covering the protests were mobile, one person newsrooms. For example, The Stranger's Heidi Groover seemed to be everywhere at once, talking to protestors, filming interactions, providing commentary, and offering up a few quips about the ratio of journalists to protestors and the ubiquitous shots of the shuttered Starbucks on Capitol Hill. Many of the participants in the protests were also providing live updates. Twitter and Instagram relayed a steady barrage of imagery and updates throughout the day.